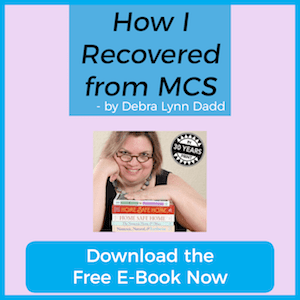 In honor of the upcoming MCS awareness month in May, we have asked Debra Lynn Dadd to write a guest post about her personal battle with MCS and more importantly discuss her road map on How To Recover from Multiple Chemical Sensitivities (MCS) (MCS) and Other Environmental Illnesses. For those who are unfamiliar with Debra’s work, it is quite remarkable. Debra Lynn Dadd brings more than thirty years of research and real-life experience to her work as a consumer advocate for health and the environment. The author of Toxic Free, Debra was the first to alert consumers to the toxic chemicals present in everyday household products and reveal both the short- and long-term health effects, as well as safe alternatives. 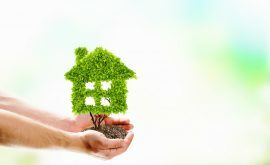 The following post was written as a road map for Debra Recovery and offers great insight on removing toxic exposure from your environment to lead a healthy life. In 1978 I had the worst experience of my life. At the young age of twenty-four, I suddenly began to have a collection of physical and mental symptoms that didn’t add up to any illness I could recognize. It started with insomnia—not being able to fall asleep at night and then not being able to wake up in the morning. As a result, I was constantly fatigued and lacked motivation. I was usually depressed and much of the time I felt confused and disoriented. I then began eating obsessively and gaining weight. I would quarrel with people for no reason, would often cry uncontrollably for hours on end for no reason (one day I cried 12 hours straight) and would become hysterical. And that was only the beginning. But this experience was also the greatest blessing because I learned how toxic chemicals found in everyday consumer products and building materials used to construct our homes can cause major physical and mental disruptions that can lead to all kinds of illnesses. And knowing this, I was able to figure out how to restore my own health and then help others do the same. As I began to research toxic chemicals in consumer products, I found out that formaldehyde causes insomnia and all my permanent-press cotton/polyester bed sheets were emitting formaldehyde as I was sleeping on them. I traded my sheets for 100% cotton untreated sheets, and my insomnia immediately ended. When I stopped wearing perfume, my headaches disappeared. After I asked my father to rig up a filter on my shower head to remove chlorine fumes, I could take a shower without fainting. One by one, as I removed toxic chemicals from my home, my symptoms also vanished. My direct observation of the correlation between symptoms and chemical exposure convinced me that these chemical exposures were, in fact, the cause of my ill health. For more than three decades now I have been happy and healthy and very active doing a lot of things I love to do. So I know it is possible to recover. 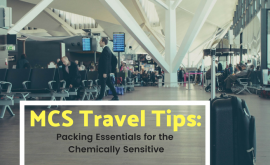 Since May is MCS Awareness Month, I want to give my perspective on Multiple Chemical Sensitivities, and share a bit about my own experience with the condition, how I recovered from it, and how it can be prevented. I was one of the first to be diagnosed with MCS, so at the time there wasn’t much information about the nature of MCS or how to treat it.After being diagnosed, I moved to another city and began treatment with another doctor who practiced environmental medicine. My new doctor noticed that I was the only one of his patients that was recovering. He asked me what I was doing and I told him I was removing the toxic exposures at home. He hired me immediately to start educating his patients about toxic exposures. He sent me to visit their homes and help them find the toxic products and replace them. In 1980, after seeing my success with the patients I was counseling on removing toxins from their home environments, an immunologist asked me to come and work in a new office he was opening in San Francisco. In 1982, with this doctor’s help and support, I self-published a book called A Consumer’s Guide for the Chemically Sensitive. This was the first book to explain MCS medically and give practical solutions for recovery. This book contained an article we wrote called “Multiple Chemical Sensitivities and Immune System Dysregulation” (which you can read in my free ebook How I Recovered From Multiple Chemical Sensitivities. At the time we called the illness Multiple Chemical Sensitivities, but it was also called many other names. Eventually, MCS became the accepted term. In the beginning, MCS looked like an “allergy to chemicals.” But it turned out MCS was not an allergy at all. MCS reactions do not involve the same body mechanisms that cause allergic reactions to pollen, dust, animal dander or molds. Traditional allergies produce a few specific symptoms to a limited number of natural inhalants. With MCS, a much wider range of complex symptoms are caused, involving every organ system. For those with MCS, virtually any substance—natural or synthetic—can provoke almost any symptom. Those with MCS often experience a variety of symptoms, as I did, which seem to not relate to each other. In particular, those with MCS often have surprising and dramatic cerebral and behavioral reactions including dizziness, confusion, inability to concentrate, mood swings and more. Even handwriting can change when a person with MCS goes into a reaction. Another common behavioral symptom is insatiable hunger, which leads to incessant eating and often obesity. Eating is no longer about nutrition or even enjoyment, it’s about stuffing food into your body, particularly sweets, to calm overwhelming cravings that arise when exposed to petrochemicals. This can happen even from something as slight as a passing whiff of perfume. 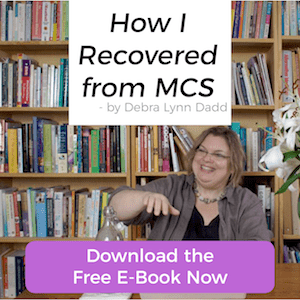 The doctor I worked for found that MCS was an immune system condition that was the result of specific immune system cells being damaged or destroyed by exposure to petrochemicals of various kinds. And that the condition could be reversed by protecting these cells from the chemicals that damage or destroy them, allowing them to regenerate naturally and resume their normal regulatory function. The most effective way to accomplish this was to simply remove the patient from the chemical exposures that created the condition in the first place. And this has been the main treatment for MCS since. I did many other things to support the regeneration of my body, but the essential thing that anyone with MCS must do to recover is to stringently eliminate any and all exposures to chemicals synthesized from petroleum. For seven years I worked to create less-toxic environments to live in, including moving from the city to living in a forest. And finally, after seven years, I had recovered enough to get on an airplane, fly to England, and live in hotels and eat in restaurants for a month with no symptoms. A body can restore its natural immune function when it is no longer exposed to the toxic chemicals that are damaging it. It is clear that MCS is an environmental illness, that is, an illness caused by the environment affecting the body. Anyone. Not extra special sensitive people. Anyone. • 3 to 5% of the population is disabled according to Chemical Sensitivity in studies conducted by governments across the globe. • 30% of the elderly are Sensitive to Chemicals. 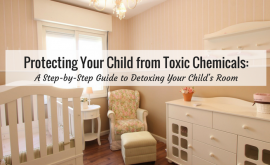 • 40% of the general population may be affected, although they do not realize that their symptoms are related to “toxic” exposures in the home, school or work environments. After a long period of exposure to these toxins, individuals become much less tolerant to environmental exposures. • 60% of Chronic Fatigue Syndrome patients, Fibromyalgia patients and Gulf War Syndrome patients are Chemically Sensitive. And she goes on to outline exactly how to identify if you are chemically sensitive. Unfortunately, developing MCS is not the only danger of exposure to toxic chemicals in everyday life. 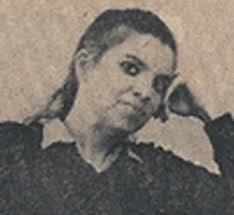 In 1978, when I was diagnosed with MCS, it seemed like MCS was a strange malady that affected only a few ultrasensitive people. Indeed, there wasn’t even a field of toxicology at the time, as we know it today. While toxic exposures have been studied throughout human history, there is a big difference between the study of natural poisons and the study of the dizzying array of toxic chemicals that have been in production only since the beginning of the twentieth century and which have increased dramatically since the 1950s. I’m not a professional toxicologist, but I have been studying the field of toxic chemicals for almost forty years now, in order to understand what I and everyone else is being exposed to from consumer products and building materials. In 2010, when I was working on my book Toxic Free, I decided to do an up-to-date search on the health effects of toxic chemicals. I was shocked at what I found. 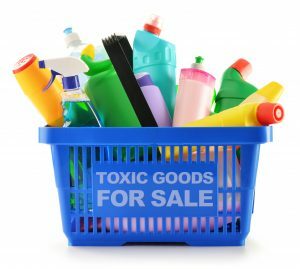 Today is ample evidence that specific toxic chemicals affect whole body systems, in fact, toxic effects are now associated with each and every body system. This was so striking to me that I wrote twenty-five pages in the book, showing how toxic chemicals affect each body system. I feel confident in saying that, today, every illness can be considered an environmental illness. And I’m not the only one saying this. Have happened over the same time period as the increase in environmental pollutants, from 1960 to the present time. And the list goes on and on. These are chemicals all of us are exposed to every day unless we take specific actions to identify and reduce our exposures. And he found the same correlation between the increase in chemical production and obesity: The sponsors of this report included Exxon, Royal Dutch Shell, and Colgate-Palmolive. The evidence is obvious. The scientific studies exist. Each one of us needs to take measures to reduce our chemical exposure. When I was in grade school, my mother worked. So after school, I would go to a neighbor’s house until my mother got home. This neighbor also had children, so we would all play together. One of my favorite games was called “Hiding in Plain Sight.” Mrs. S would take an object, show it to us, then we would close our eyes and she would hide it in the room, right in plain sight. The game for us was to find this object, which often was quite difficult, even though it was in plain view. Toxic chemicals in our environments remind me of this children’s game. Toxic chemicals are all around us—in many consumer products, in the food we eat, the water we drink, and even in the air we breathe. Yet many people can’t see them, smell them, taste them, or feel their effects. But they are right in plain sight if you know what to look for. Here are just a few sources of toxic chemical exposures that can contribute to MCS and other environmental illnesses. Removing these exposures and replacing products with nontoxic alternatives can greatly help to restore good health. Cleaning products. I always recommend starting to eliminate toxic exposures by removing all the cleaning products from your home. They contain ingredients so toxic that they are governed by the federal Hazardous Substances Act. Try shopping for cleaning products at your local natural food store or make your own from simple ingredients like baking soda and vinegar. Pesticides. Next, find all the pesticides in your home. Fly spray, moth balls, roach killers, flea bombs…just stop using these and other pesticides. In fact, take whatever pesticides you have in your home to your local household hazardous waste facility (along with your chemical cleaning products). Look online or at your local natural food store for nontoxic pest controls. Pests can be controlled naturally. Perfume and scented products. Of all the toxic exposures there are, one of the worst for people with MCS is perfume and scented products. These do more than trigger reactions for those who are sensitive, these perfumes and scented products are actually made with very toxic chemicals. Round up everything in your home that is scented and remove it. Some of them might not be so obvious. Laundry detergent, for example, is often one of the worst offenders, and all your clothing that has residues of that detergent scent. Many unscented products are available. Choose those instead. This is just a start. My book Toxic Free outlines the top 50 toxic exposures you are likely to find in your home. There are many things that contribute to good health—including good nutrition, exercise, and getting enough sleep. But the most important thing is to reduce exposure to toxic chemicals. This is important for everyone, but it is vital for anyone with MCS. 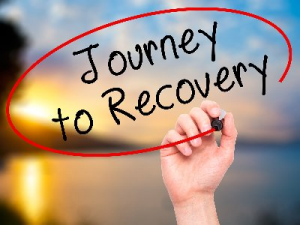 It is the key to recovery. When I was working in the doctor’s office helping patients eliminate toxins from their homes, a woman who was extremely sensitive to chemicals contacted this doctor. She was so sensitive that she could not come to the office. At this time I was also doing provocative-neutralization testing for this doctor, so he sent me to her to test her and find out what she was most sensitive to. This patient was staying in a small beach town about an hour away from the doctor’s office. She had rented a little house on a bluff overlooking the Pacific Ocean. The air was about as clean as it gets on this planet. I ended up staying in this house with her and her caretaker for a month. I had absolutely no stress. All my meals were fixed for me and the food was 100% organically grown. I drank only spring water bottled in glass. I had no responsibilities except to test this woman for various substances that might be causing her reactions, and I could only do that for about an hour a day because she was so sensitive. We spent all our time outdoors. We even slept outside. Every day we would go for a walk along the beach into town to buy organic food at the local co-op. The rest of the time I could do whatever I wanted. Spending a month in this as-clean-as-humanly-possible environment was the turning point for me in my recovery from MCS. At home, I had removed all the toxic chemicals from my bedroom, but the rest of the condo was still toxic and I was living in the middle of a city. Out on that bluff overlooking the Pacific Ocean, in a clean environment, my body quickly healed. This showed me quite clearly that my symptoms were associated with the chemical exposures I was experiencing in everyday life. I also observed in the patients that I worked with that many of them had food allergies. Yet, when I would send them off for a beach vacation, they would come back and be able to eat anything they wanted. It was clear that exposure to toxic chemicals in the home and everyday environment were causing effects on the body that went beyond being able to see the direct cause and effect. Today I don’t think much about MCS. I consider myself “recovered”, that is, I can go about daily life without reacting to everything all the time. This is the result of minimizing my exposure to toxic chemicals in my home, so my body can then go out into the toxic world without reacting. People with MCS have very specific needs. While it’s fairly easy to get a water filter to remove chlorine, fluoride and other toxic pollutants from tap water and organic food without toxic pesticides, it’s more difficult to find products that will help with the toxic chemicals we breathe in the air every day. 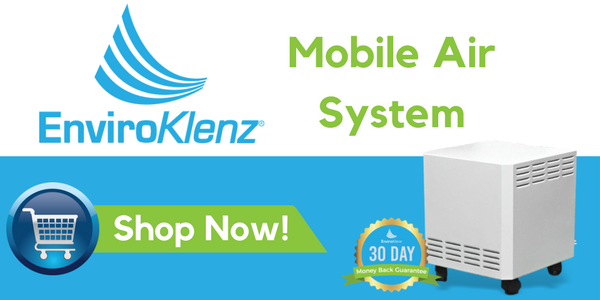 EnviroKlenz has developed a whole line of products specifically designed to help people with MCS eliminate toxic exposures in the air. They have a technology that actually breaks down toxic chemicals into harmless elements using a mixture of natural metal oxides. This technology is used as the basis for a variety of products that can help those with MCS (and other environmental illnesses) to manage their toxic exposures. EnviroKlenz is continually coming up with new ways to incorporate their technology into helpful products. Here are some examples. 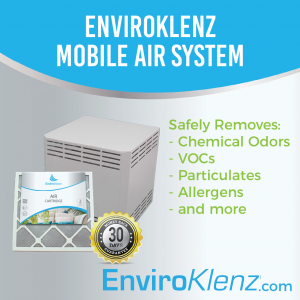 EnviroKlenz Mobile Unit is a high-powered air filter that will quickly destroy many types of volatile organic chemicals (VOCs) that may be in your indoor air, including perfume, paint fumes, pesticides, carpet fumes, and other vapors. The EnviroKlenz HVAC filter also contains their technology and will do the same when installed in an HVAC system. 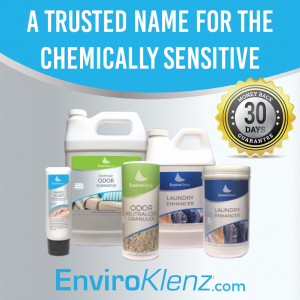 EnviroKlenz Laundry Enhancer is your trusted source for removing fragrance from your clothes and linens. The enhancer was designed to be used with your typical favorite detergent by neutralizing the odors and fragrances from your clothing without the use of harsh chemicals, masking agents or fragrances. 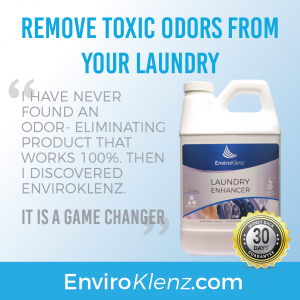 EnviroKlenz Laundry Enhancer can be used to remove a variety of stubborn odors associated with sweat & body odors, chemical odors, musty & mildew smell, fragrances, and perfumes on new or thrift store clothing, as well as scents left behind by detergents and fabric softeners. 1) We live in a world where toxic chemicals are everywhere, especially in our own homes. 2) These toxic chemicals we are exposed to have health effects that can damage every one of our body systems. 3) By removing these toxic chemicals from our homes, we can have better health.